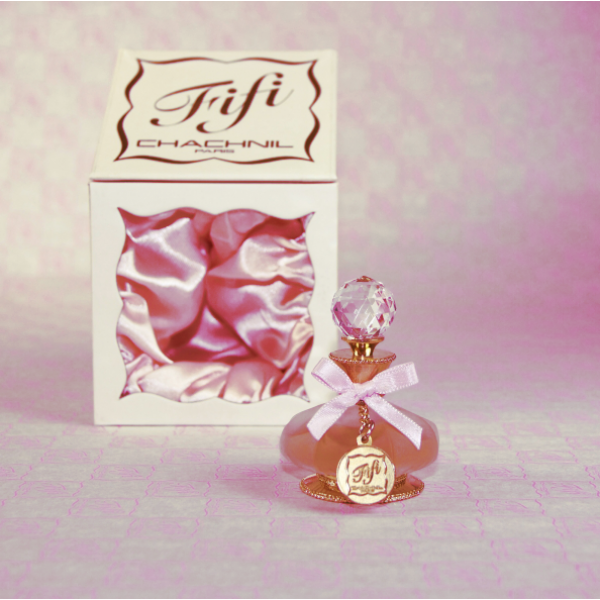 The classic Fifi Chachnil fragrance is ‘Fifi’. ‘Fifi’ is a perfume of intense femininity, along with all of the contradictions implied: fanciful & subtle, strong & courageous, innocent & tender. The scent begins with light and spicy notes of citrus fruits and coriander mixed with the powdered sweetness of rose. Amber brings oriental harmony to the scent whilst being spiced up by tobacco. The packaging is a direct example of Fifi’s frivolously beautiful and extremely feminine style with the frosted glass, pink and gold accessories and antique style atomizer.